Fall Harvest Snack Board, a pickable platter of roasted pumpkin, acorn squash and autumn chestnuts with dried apple chips, pomegranate and cranberries. Fall is officially here! I wish I could say the weather here in California agreed with me (we had two 90+ degree days this week) but in my mind it’s nearly Halloween, which means it’s officially autumn no matter what it feels like outside. If you’ve been following the blog for long you’ll know that I create a monthly seasonal platter of fresh in-seasonal produce. When brainstorming ideas for October’s seasonal platter, I absolutely knew squash would made an appearance. And October 2017’s platter ended up with not one, but two of my favorite types of squash: acorn and pumpkin. One of the first recipes I ever posted on the blog is Roasted Acorn Squash with Maple & Sage and it’s still one of my favorite ways to flavor roasted fall squash. So why mess with a good thing? 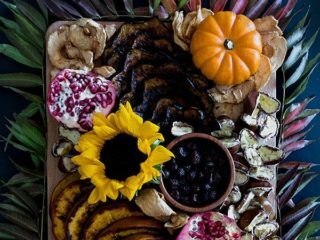 This Fall Harvest Snack Board builds upon the recipe by including an array of fall vegetables and fruits, including pomegranates, cranberries and dried apple slices (which a great workweek snack!). But one of my favorite foods on this fruit platter is surprisingly making its first appearance on the blog: chestnuts. Chestnuts are one of our favorite fall and winter foods. I cherish the day each fall that I see chestnuts in the markets for the first time because I know we’ll be roasted them as an appetizer or dessert and enjoying with a glass of red wine. We may or may not sometimes make an entire dinner out of chestnuts, cheese and wine. Hey, it’s a vegetable! This Fall Harvest Snack Board is super simple to make. Roasting the squash and chestnuts can be done ahead of time for a quick make-ahead dish for a fall party. I had plenty leftover squash when we finished and I saved it for one of my favorite recipes, Pumpkin, Butternut Squash & Sage Soup. 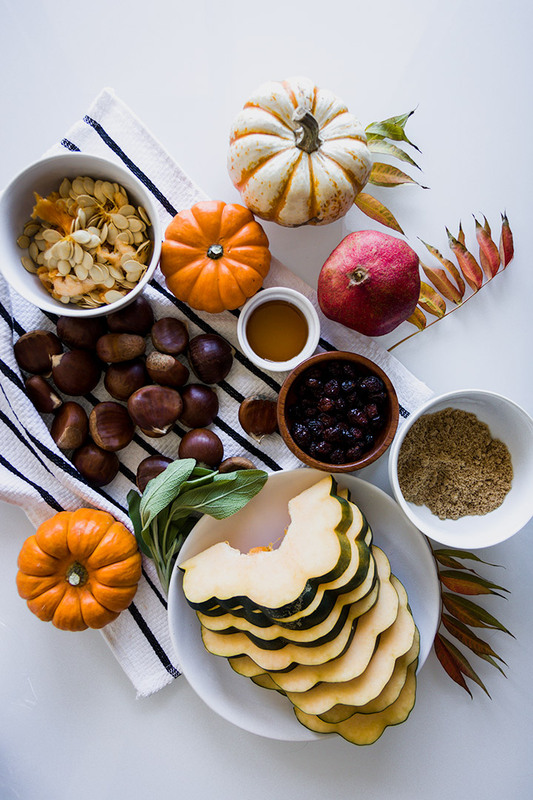 Being that this Fall Harvest Snack Board is about as simple as platters come, there are a few tips and ingredient recommendations I can make to ensure a delicious platter every time. Quality Grade A Maple Syrup. If you’ve hadgood quality maple syrup then you know there is no comparison between grade A maple syrup and what you’ll find at most chain diners (no offense chain diners, you have your time and place). Tip: Use an ice cream scoop to deseed squash. Stop pulling out wet squash innards with your hands! I use this ice cream scoop, which has a slight rectangular shape and helps dig the seeds out of those pesky pumpkins. Lightly sweetened dried cranberries. Have you tasted a dried cranberry that hasn’t been sweetened? Sour doesn’t begin to describe it. I love cranberries when they are lightly sweetened but still retain a sour taste that makes your mouth pucker.These dried cranberries pair well with the savory squash and chestnuts in this Fall Harvest Snack Board. Slice acorn squash and pumpkin in half, remove seeds, and slice into 1/2 inch pieces. Place onto oiled cookie sheet. In a small saucepan, combine maple syrup, brown sugar, butter and oil over low heat until sugar dissolves. Brush liquid over acorn squash and pumpkin pieces. Bake pumpkin and squash for 15 minutes on each side, or until golden brown. Slice chestnuts in half when raw and place into a large pot over medium-low heat. Heat until semi-soft, being careful not to over cook (about 20 minutes). Place squash, pumpkin, and chestnuts on a large cutting board or platter. Add apple chips, cranberries and pomegranates. Drizzle with maple syrup and enjoy! 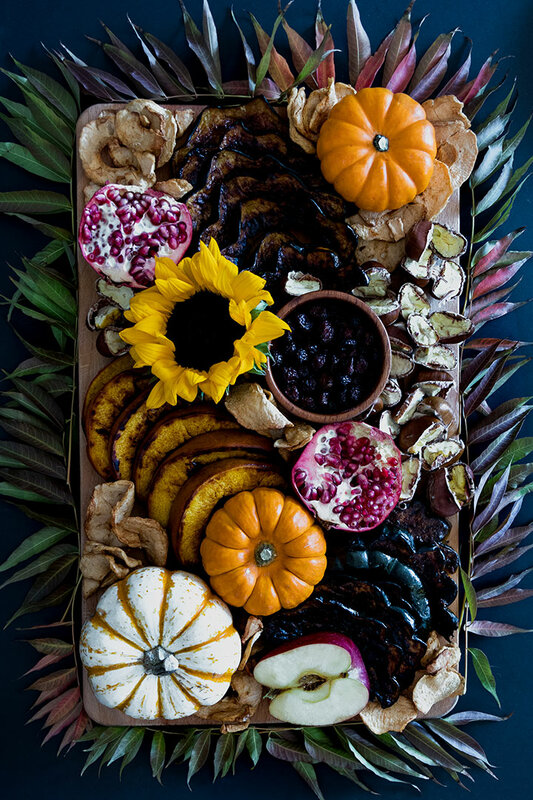 Love this fall harvest snack board? 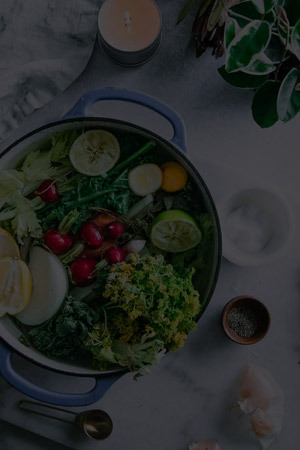 Try out another of my favorite fall-inspired dishes and take advantage of autumn harvest fruits and vegetables while they are still in season. Hasselback Fall Fruit Platter: a platter of baked apples and pears with my Maple Walnut Granola. Perfect for breakfast, dessert, or a snack! Smoked Golden Beet Carpaccio: looking for a hearty, but flavorful, salad? This golden beet and frisée salad features a delicious smoked salt dressing. Turnip Carrot Cakes with Garlic Aioli: let me change your mind about turnips! I promise you’ll love them in this easy veggie cake recipe.